* Time to prepare, time to plant & grow. Nowadays, when you buy plants, you can expect them to arrive in a timely fashion and well-packaged. But this information on unpacking and planting will help the survival of your plants even more. You'll also find below the latest plant offers that I've received from the nurseries in your country. review the important unpacking and planting information just below. Strawberry plants arrive in good condition as bare roots. This plant pack filters excess sunlight, keeps root ball moist & protects leaves. It's easy to open too. Unpacking Blueberry Bushes sent in air-cell padded cardboard box. When you buy plants by mail-order they come in several kinds of packs. These are designed to protect the plants from damage and keep them in good condition. Nevertheless it is essential to unpack and inspect your plants as soon as possible after they arrive. So try to arrange not to be away around the expected delivery date , or provide a shady location where your order may be safely left. Note that most live plants are sent out on a seasonal cycle. 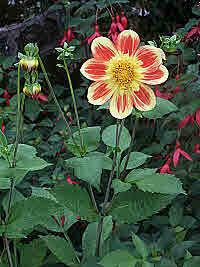 You will receive these when they are ready for planting, rather than when you place your order. 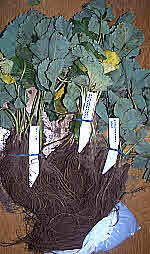 You can expect nurseries such as DirectGardening - U.S.A. - Suttons Seeds - U.K. and others featured on the-organic-gardener.com to have arrangements that take account of local growing conditions. 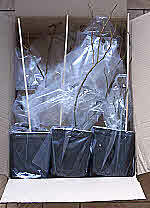 Bare Rooted Shrubs and Herbaceous Plants: Fruit canes and the like are best sent in brown paper packs. Polythene bags are sometimes used for herbaceous perennials. They all need to be opened checked and planted immediately. Bare rooted plants are normally sent out when dormant or just as they are about to grow. If your garden earth is too cold, wet, or ice bound for planting, you might temporarily store your plants in pots of moist compost. Note: plants sent in a dormant state - like those in the box picture right > may look as if dead - don't worry, the shoots will soon grow. And I'm picking the berries already. Plugs and Strips: I recommend the larger plug sizes when buying plants. When available these extra strong roots give your plants a better start. They should arrive in neat packs and in good condition. Healthy growing plants supplied in containers. Container Grown / Potted Plants: You can buy plants in containers for planting at most times of year. They have actively growing roots. So you can remove the container and plant the whole root ball with minimum disturbance. Note: You might buy plants in containers during flowering. But they will need time to establish themselves to reach their full potential. ...and for discerning European gardeners - click here. ...and for Wholesale Prices on Plants in the U.K. - click here. All these are the plant storage organs and they make a nice way to buy plants. 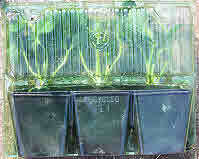 They are used to propagate and grow new plants. Nurseries send out large numbers of dormant bulbs, and corms for gardeners to plant. 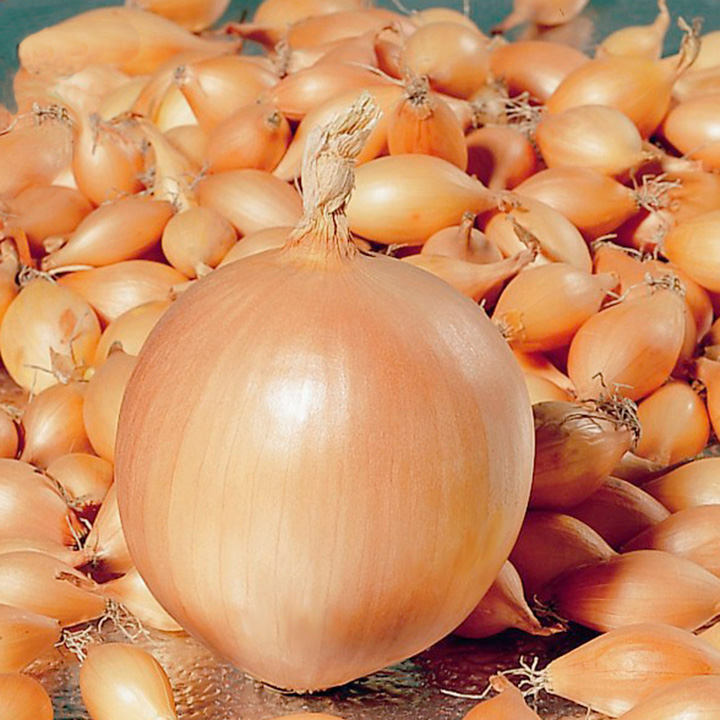 Onions can be supplied as small bulbs known as sets. 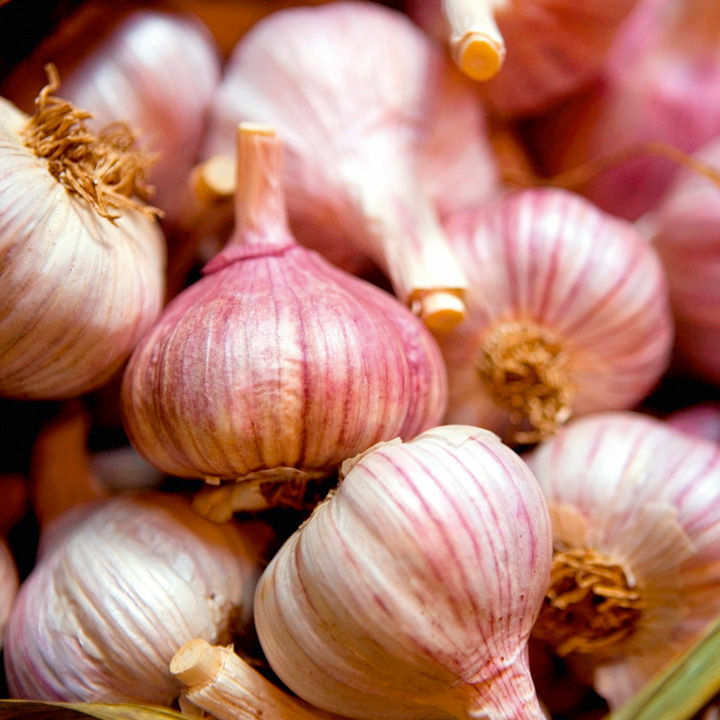 Garlic splits into c10 separate cloves to plant & grow more. Bulbs: are fleshy leaf bases. They are attached to a short stem or base plate from where they wrap around the flower buds that are tucked inside. Daffodil bulbs can be squeezed into multi-level tiers (i.e. different planting depths) that produce a mass of flowers. You might plant your containers like this. 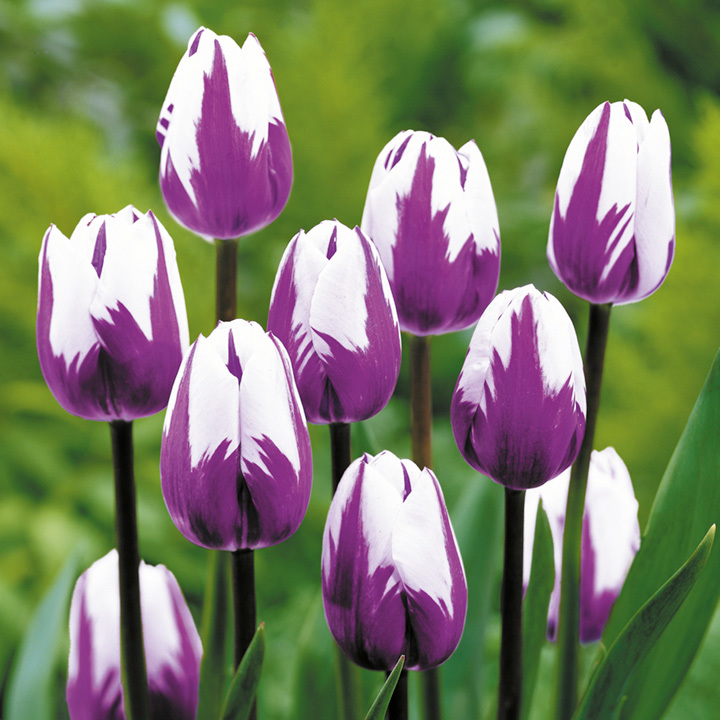 Tulips bulbs have contractile roots that pull them back into the ground to maintain depth. 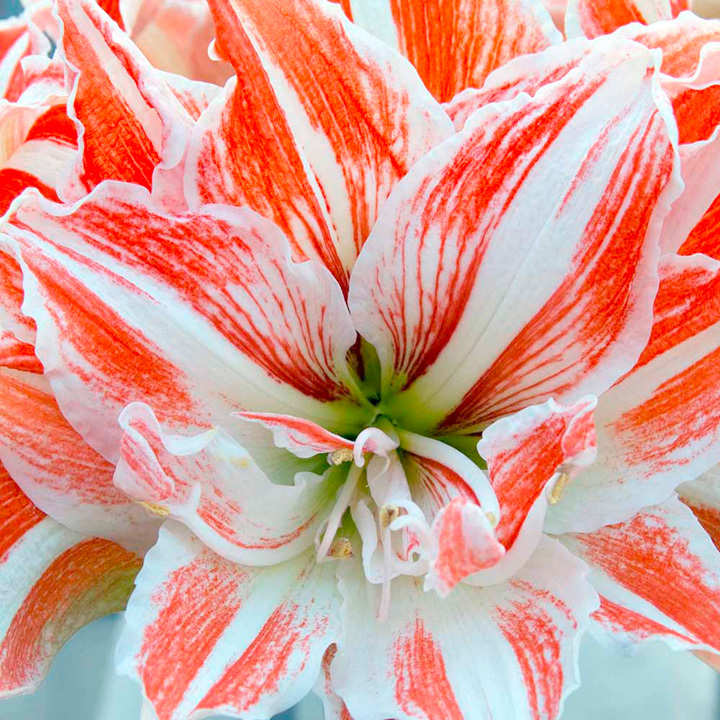 Lily bulbs grow into distinct fleshy segments that can be broken off and used for propagation. After a few years of rearing you will have more flowers and less need to buy plants. See specific planting instructions provided with your bulbs. Planting pockets for most bulbs should be bedded with a little grit to ensure free-drainage in heavier soils. I mix in organic bone meal to feed strong new root growth. Large doses of nitrogen feed are best avoided. Corms: are stems that are compacted vertically but enlarge radially. You may see corms with dormant buds aligned along a spiral. A new corm grows on top of the old, but contractile roots pull it back into the ground. The old corm beneath withers away. Corms are often referred to incorrectly as bulbs - learn more with the-organic-gardener.com. See specific planting instructions provided with your corms. Planting pockets for most corms should be bedded with grit to ensure free-drainage in heavy soils. I mix in organic bone meal to feed strong new root growth. Rhizomes: are underground stems that grow horizontally. They may also enlarge as storage organs. Therefore new rhizomes branch out sideways from leading buds and may leave old rhizomes behind them. Note: Stolons are stems that spread above ground to produce roots and leafy shoots e.g. Strawberries are easily propagated from stolons. growing potatoes... compare Sweet Potato below. See specific planting instructions provided with your tubers. Care needs to be taken to set root tubers at the correct depth and at the proper time. Find specific cultural instructions for your plants on links below. Why not take advantage of the 1¢sale - this link shows you how it works. For Suttons Seeds growing guides and videos click here. For Thompson & Morgan cultural instructions click here. Your plants come direct from large nurseries that are higher up the supply chain than local garden centers. And they are well cared for by dedicated staff. Well, that's if you use the links on these pages. You will sometimes see the name of the packer who inspects your plants written on a slip with your order. More than anyone, these horticulturalists understand the needs of gardeners and landscapers who buy plants. They send your plants at the very best time for success. Their business success isn't about retail, but about the choice and quality of the plants themselves. Alternatively, if you buy plants from local garden centres you get the opportunity to check the plants yourself. Reject plants growing in dried out compost, or with browned off leaves. Avoid thin spindly growths and look for compact specimens with plenty of buds to grow on. Although container grown plants are less disturbed by transplanting, it's not the best time for planting when they are in flower. Because at that stage they will take longer to establish. So it's a really good idea to check out the pictures on the sites I link to and order what you like in advance. Don't let me put you off - but gardeners seem to spend a huge amount on spontaneous plant purchases that will come to nothing. And preparation is key to successful gardening. So start from here where important information is updated, accessible, and comfortable to read. Finally, where you have the choice in plug plants for bedding, always select jumbo sized plugs. Larger root systems will support your transplants through any difficult conditions they may encounter. And that helps you to avoid losses. Here Are The Latest Seasonal Offers - and there's more links further below to my recommended mail-order plant suppliers. Click Here - to see Free Gift Descriptions at DirectGardening. Find Special Seasonal Offers From Suttons Seeds are here. TIP: - Get started quickly, for less, when you take advantage of vegetable, flower, and hedging plant collections available from the links below. Discover What's New in Garden Plants - click here. One of the easiest ways to buy plants for a new garden is to simply select from one of the many Pre-Planned Gardens on this link. Want to know the plant treasures that gardeners are looking for today? Here's a link to customer favourites - and what a lovely selection it is! Add beauty to your yard! Blooms year after year without replanting! Get a start with some of America&apos;s most popular perennials without spending a lot of money - a total of 20 plants of five varieties for one low price! You&apos;ll enjoy a kaleidoscope of color all summer. Plants are selected for their beauty, vigor and interesting shapes and heights. They're all easy to grow perennials sent from strong, nursery-grown, 1 year old stock. 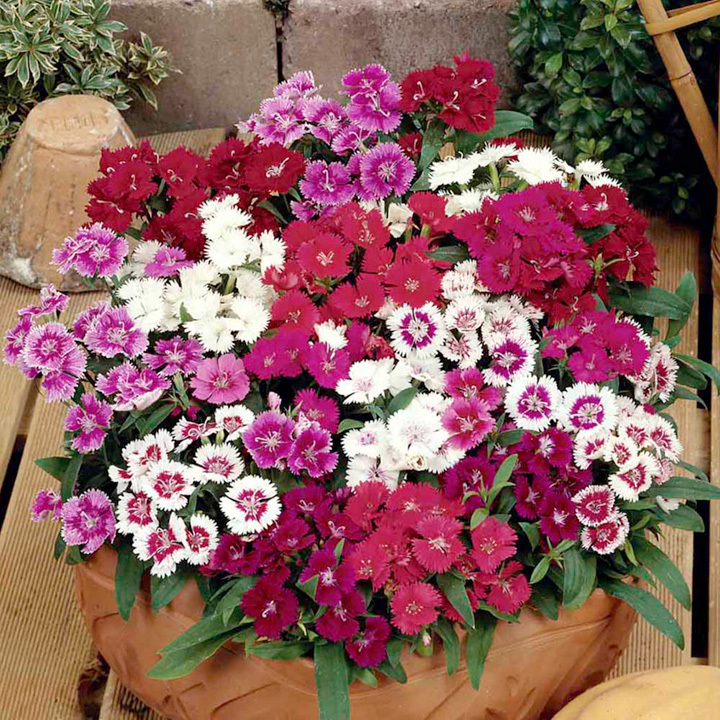 Varieties may include: Balloon Flower, Golden Sundrops, Hens and Chicks, Bleeding Heart, Painted Daisies, Delphinium, Liatris, Carnations, Astilbe, Hibiscus, Hollyhocks, Columbine, Achillea, Japanese Iris, Butterfly Plants, Phlox. With Plants, Choice Is Everything. And to be honest I pick the best. So here's an excellent alternative selection to help you find what you are really looking for. Home Of The Organic Gardener - growing naturally, pure and beautiful. ^ Reach the top to discover more when you buy plants.